There’s a pattern to any long haul flight, which goes something like; watch movie, eat dinner, watch movie, wriggle and fidget for a few hours wishing sleep would just happen while the cabin staff disappear somewhere for the rest of the night, give up and watch another movie, eat breakfast, fall fast asleep with fifteen minutes to landing time. Last night, we were only a little while into the wriggle and fidget bit when we began to get the impression that just possibly someone was smoking. After a few more wriggles and fidgets the bloke in front of us stood up, as did his wife across the aisle, his father beside us and his mother from somewhere else. It seems his in-flight entertainment system had of its own volition, put on a display of pyrotechnics and was attempting to fill our little bit of the cabin with some nasty rich substance which bore little resemblance to the air we usually quite like breathing. It is fair to say that the cabin staff, by now to a person bright eyed and bushy tailed, did not exhibit any natural aptitude for tracking down smouldering wiring mid flight. Shutting down the bank of entertainment units for the duration seemed to be a wise and logical thing to do. Every so often for the rest of the flight some hitherto unseen crew member would wander in to our space, nostrils aquiver in the manner of a sniffer dog, and declare that perhaps the smell was getting better. In our sleep curtailed state it was all we could do not to throw them a toy to tug on as a reward. 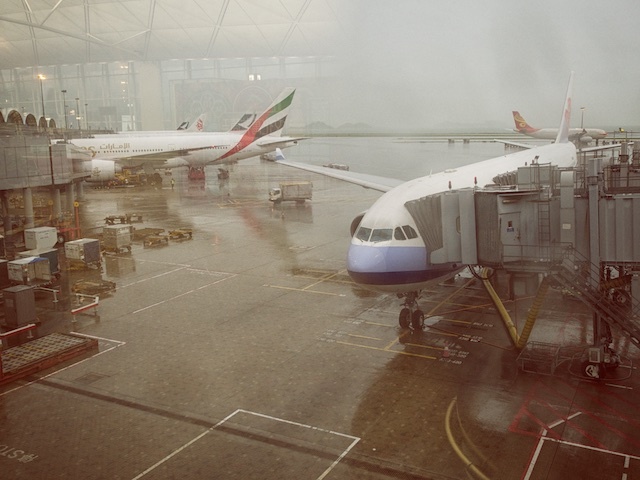 We have but six more hours to wait in Hong Kong, feeling as washed out as the tarmac, with the smell of half-finished movie lingering in the sinuses.